Having hit an all-time high in April and surpassing the previous cycle peak recorded in May of 2006 by 4.1 percent, the Case-Shiller Index for single-family home values within the San Francisco Metropolitan Area effectively stalled in May, eking out a 0.1 percent gain. At the same time, the index’s recorded year-over-year gain, the pace of which has been on the decline since the third quarter of 2015, measured 6.5 percent in May, the lowest year-over-year gain since the third quarter of 2012. 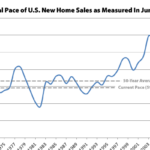 The index for single-family home values at the bottom third of the market, however, gained 1.3 percent in May, is running 11.1 percent higher versus the same time last year and has more than doubled since bottoming in 2009, but it remains 14.0 percent below its 2006 peak. The middle third of the market gained 0.5 percent in May, is running 7.4 percent higher versus the same time last year, has gained 81 percent since 2009 and is now 3.7 percent above its 2006-era peak. And while the index for the top-third of the market remains 19.3 percent above its previous cycle peak hit in August of 2007, it slipped 0.5 percent in May and its year-over-year gain of 4.9 percent is the lowest since the third quarter of 2012. The index for San Francisco condo values was unchanged in May, holding at an all-time high which is 22.4 percent higher than its previous cycle peak in October of 2005, while the year-over-year gain slipped to 6.3 percent, the smallest year-over-year gain since mid-2012. The index for home prices across the nation ticked up 1.2 percent from April to May to within 2.1 percent of its July 2006 peak while the year-over-year gain held at 5.0 percent. And for the third month in a row, Portland, Seattle and Denver reported the highest year-over-year gains, up 12.5 percent, 10.7 percent and 9.5 percent respectively. Our standard SocketSite S&P/Case-Shiller footnote: The S&P/Case-Shiller home price indices include San Francisco, San Mateo, Marin, Contra Costa and Alameda in the “San Francisco” index (i.e., greater MSA) and are imperfect in factoring out changes in property values due to improvements versus appreciation (although they try their best). The graph is informative and especially so in light of the past 4 or so years and the huge housing price increases here. 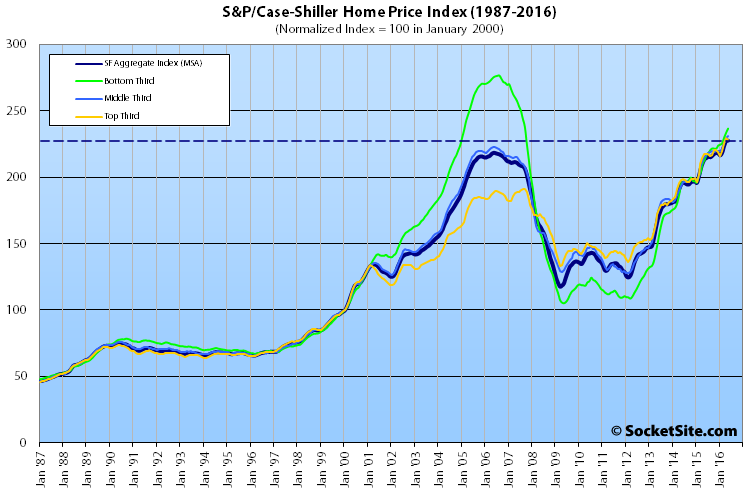 Of note, prices in the SF metro area remained flat for almost a decade from the late 80s until 1997 or so. Another point is the almost 3 year drop in prices from 06 to 09. A quite significant price drop. Many recall that drop, but I suspect many may not be aware of the stagnant prices through most of the 90s. It appears prices peaked/started leveling in late 2015. By a number of indicators. The question is will SF see an extended flattening of prices as in the 90s or an actual modest drop in prices – a trough in the graph but not of the magnitude of that caused by the great Recession. 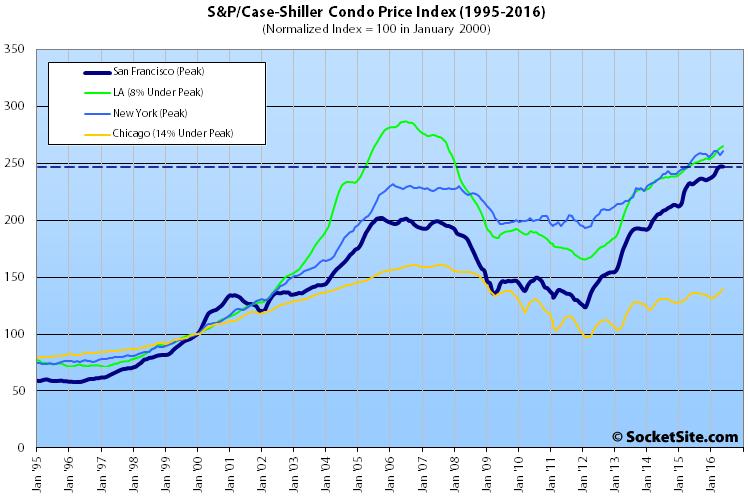 Nationally prices are holding relatively better than in the SF area. Again Portland and Seattle are at the top and, though the national price gains are modest, real estate is local and some markets like the Northwest are showing much stronger than SF. This latter factor – certain markets appreciating faster than the Bay Area and that continuing for a few years (I am betting on it lasting 10 – 15 years in Portland and Seattle and other NW locales) is good news for SF and the Bay Area. Housing becoming relatively more affordable here over the next decade versus other prime markets will not only make it easier for residents to afford homes here but for businesses to grow and expand here. In addition, some of the hyper investor pressure which has commoditized Bay Area housing to a degree will be lessened as investors look to other markets which promise more short/medium term appreciation. A rebalancing is long overdue and this may be the start of that. A lognormal y axis would better show the earlier history. Mmmm…the assertion about the late 80’s through 1997 prices being flat is incorrect. I was here from 1986 onward and in 1988-1991 all the same things about “buy now or you will be priced out forever” were said. You could buy a 3/1 in Midtown Palo Alto for 200K at the time. So two cub engineers at any semiconductor company could own in P.A. The market peaked in 1991/2 and then declined for several years. It reached the 1991/2 peak in 1997 again. There may be some upper limit to what working people can pay for housing, however in terms of the investor class, the BC government has just introduced a 15% foreign buyer tax in Metro Vancouver and that is sure to drive some Chinese demand down to San Francisco or Los Angeles. I’m looking forward to a little bump in prime neighborhoods as that new law in BC takes effect. Dave, good points but I keep hearing people echo your prediction with such confidence that housing prices may soften but won’t go down but not with the same ‘magnitude as the Great Recession.’ This has become very commonplace. Realtors and pundits everywhere are saying that same thing with such confidence. How can one be so cavalier about the downside of this meteoric rise in home prices? I believe there is more evidence for a massive decline than for a flattening. How much historical precedence is there for massive quantitative easing and interest rate distortion? I think it is foolish to think we went through a ‘Great Recession’ anyway, all we did was kick the can down the road. It seems to me that it hasn’t even happened yet. The ’07 housing bubble was national, global even, and spanned all income levels since you could simply lie about your income. There are some bubbly regions and price tiers now, but I don’t think we have the breadth of a housing problem as we did back then. Areas that had high price run ups could easily see large price corrections though. Personally I think that SF/Bay Area prices will not just flatten but see a modest decline of 10% – 15%. Real estate is local and what happens in the Bay Area will not be reflected in every market. Some markets have still not come back to their pre-recession prices. Some markets are in judicial states and have still not worked through all the foreclosures from the Great Recession – as in deals still out there. Some markets are very affordable still and seeing population growth and hi-tech job relocation. The US population is growing and folks need to live somewhere. Much of that growth is immigration and these people will most likely not buy but rent. Hence rental SFHs IMO are a bullish investment, depending on the market, in the immediate future. Beyond that, the Millennial “bubble” group will not reach optimum first home purchase age for 7 or 8 years at which point an appreciation spurt in home prices is likely to happen. Beyond all this, the world is moving it unfortunately seems into more chaotic times. The news from France today. Foreign money will seek the safety of the US in the coming years. Which will mitigate to an extent the downward pressure on RE prices here from factors you mention . I am no Cassandra. No one can predict the future of RE. Its a crossword puzzle with many pieces and one does the best one can – and purchases/invests (or not) accordingly. Well said, sound logic from Dave and Anon that I cannot disagree with (except for Anon’s suggestion that this bubble is not global.) This is undisputedly a global bubble, again. Vancouver is a bubble, Jerusalem is a bubble, New Zealand is bubbly, the defunct mining town of Sutter Creek, CA is bubbled out. The examples are endless. Globally, there is for the most part low inventory, soaring prices, and extremely compressed days on market…and with no improvement in true underlying fundamentals like wages etc. It is still my opinion that the magnitude of this bubble is not fully realized yet at all. Rates should have headed north years ago. There is serious froth baked into equities and RE. I am predicting a 50% price correction outside of SF proper. SF proper is a special place in many ways and I agree that it will fair better than many or feel it in the way of 10-20%. Scorched earth in other areas, especially once the rent bubble bursts, which as a professional landlord I can tell you is absolutely going to happen. We more or less agree mr. myagi. SF is special. It will always have a cushion that keeps it from collapsing in terms of RE prices. I have a 90 year old neighbor who bought here in 1960 and paid what they thought was an outrageous price (12K) for basically a box. They were from the East. That home is worth 1.2 million today. History is on the side of SF/the Bay Area not collapsing in terms of RE prices. That said, whatever pullback there is, I think Seattle/Portland and other metros like the Port of Virginia area will pull back less and appreciate more for the next decade or two. Secondary markets exist where one can get 8% ROI on an SFH rental. That are shielded partly from any big downturn. As in being next to the largest military base in the US. Military couples lined up to sign 2 year leases once the home goes to market for rent. Not all areas will be scorched earth and IMO RE remains the best investment vehicle for the “regular” middle class Jane or Joe. Just not Bay Area investment property. ROI is the key and anticipated appreciation is great but – well its anticipated and not guaranteed. As we seem to be seeing with these pullbacks in SF multi-family projects. Dave, agree, I will say though that ROI as being a key metric is skewed by inflated rents which I do not believe are sustainable at all. That coupled with people buying investment properties on bogus pro-forma numbers will get smoked as they do in every cycle. I’m afraid that once there is a shakeout in rents a lot of these unsophisticated buyers (the ones who have been buying a lot in the last few years) will get hammered and the market will suffer. Rents don’t go up forever and when prices go down those people will be selling at a loss in large numbers. They will then say what they always do which is that real estate is a bad investment. That was a bit of a tangent regarding Sutter Creek. Are we now wringing our hands over rural Amador County prices? Rural Amador County prices are still not back to their 2005 peak yet. It is hardly a bubble up there (yet). It has recovered quite a bit from its 2011 low though. I’m still confused about how the price last month was an all-time-high, now we’re higher yet, but calling it a stall. Does +0.1% qualify as an “all-time stall”? Also, somehow after a 6.5% YOY gain, the story is about the action in the second derivative of price with respect to time. No narrative at work here. Exactly. No (sensible) person expects 10% YOY growth to continue. 6.5% is fantastic and in no way a negative. even 3% YoY is phenomenal after this run. No kidding. It’s not like there’s a significant change in the trend worth noting, such as the average year-over-year gains dropping from 23.2 percent in 2013, to 14.2 percent in 2014, to 10.2 percent in 2015, and from 10.6 percent to 9.3 percent to 8.5 percent to 7.8 percent to 6.5 percent since the beginning of the year. And a 0.1 percent gain in May, which is typically a strong month and hasn’t come in at under 1.3 percent, and has averaged 2.3 percent, since 2008? That’s not a stall, it’s obviously a solid sign of strength. 15,475 new workers from this subset of office projects under construction. 1. You are assuming that business will need the additional commercial real estate. The Salesforce tower still has vacant capacity. Employment is stagnating in SF. 2. East bay is under a construction boom. Lots of units being added in Alameda, which has ferry service, and West Oakland, which has a Bart station. Believe it or not, and despite what a crackerjack panel of folks might say, simply building more office space doesn’t magically create demand or new jobs (other than for construction workers). Over half the space you listed above could remain completely vacant and the vacancy rate for office space in San Francisco, the demand for which has been waning, would still remain below its historic average. But assuming every square foot you listed above was 100 percent leased, didn’t cannibalize a single square foot from existing buildings and was only occupied by newly employed folks who didn’t already live in San Francisco and weren’t allowed to live anywhere else as a condition of their employment, based on average residential occupancy rates of over 2 persons per unit, those 7,300 units could house those 15,475 workers. Heck, even if the current below-average vacancy rate for office space in the city extended to all the new projects above, but still assuming the new construction didn’t cannibalize a single square foot from existing buildings and was only occupied by newly employed folks who didn’t already live in San Francisco and weren’t allowed to live anywhere else, you could have over 500 new units to spare! I like how you called back my observation from the recent Registry forum. Kim Diamond of 7×7 Development, developers of 388 Fulton also spoke at the event. Above, I listed four, but this was clearly not an exhaustive list of office projects under construction at present. So what is the total square footage of office under construction in SF at present? Do you know? 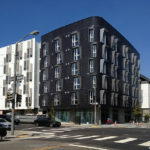 Do you think it was the “insufficient inventory to meet demand” that led to the price cuts at 388 Fulton last week? Of course that’s just one development (and the fact that new construction sales across the city are down over 30 percent in 2016, despite an even greater increase in inventory, is probably irrelevant). And yes, we do know the total square footage of office space under construction across the city, over 80 percent of which you managed to capture above. If I have covered 80% of the office space under construction, then the workers in the other 20% would easily absorb the 500 ‘excess units’ out of the 7,300 under construction your estimate (wherein every new unit in the city will inhabited by at least two class A office workers) posits. Do you think that inventory is swamping the market when the WSJ is reporting on the novel if inconsequential impact of our new ADU legistlation as a sign of the ‘housing crisis’ in which we find ourselves? What do you think office vacancy will be in 12 months? What sort of new residential developments do you think will be feasible going forward with a 25% affordable housing requirement? As an aside, if as a developer you don’t have to lower prices once during your marketing process, you probably aren’t aiming high enough to begin with. Please do recall construction isn’t even complete on 388 Fulton. While a novel argument, that’s patently false and suggests a basic lack of understanding with respect to the market. If anything, developers aim to increase prices as sales and marketing progress, it creates a sense of urgency and buyer goodwill. On the other hand, decreasing prices after sales and marketing have started, especially before construction is complete and contracts are at risk of being cancelled, typically doesn’t sit too well with those who have already committed to the higher prices, can erode any sense of urgency and certainly doesn’t convey the message you purport. I am quite sure a developer can choose his/her own approach and while I don’t know the specifics of any contracts at 388 Fulton, changes in price for the building after the contract has been signed could certainly be addressed. There’s no rule that says developers have to start low and then go up. There’s a value of certainty for first-mover buyers. The editor is ahead of the game in identifying leading indicators of a slowdown, and I don’t see anyone else really doing this publicly for SF, so kudos for that. But anyone looking for bargains today will be sorely disappointed. A more accurate headline for this post might be: Indexes for Bay Area Homes Hit Yet Another Record High, With Solid Year-Over-Year Gains of 6.5%, But There Are Signs of a Slowing. People have been crying wolf for years around here. Still waiting…. @sfrealist – Scientists have been crying wolf about the next earthquake to strike bay area. I guess there was no sense in calling out the warning signs and preparing for it if were to follow the same logic. The answer to that question … depends entirely on your timeline 🙂 The next earthquake, like the next recession, is a certainty. The only uncertainty is when it will occur, and how bad it will be. Neither can be predicted with any accuracy but preparedness is still a worthy goal. I always keep my wine cellar full just in case the water supply is interrupted when the “big one” strikes. eBART will be opening within the next year. How long does the green line (lower third) have left to run? July finished pretty strong for local tech stocks seems like. I wonder if that will have any bearing on August, which is typically slow anyway.